This super delicious sugar and dairy-free Swiss Bircher Muesli is inspired my recent trip to Switzerland. Bircher Muesli was invented by a Swiss physician at the end of the 19th century named Maximilian Oskar Bircher-Benner. It was designed as a healthy meal to speed up the healing process of his patients in his sanitarium. The original recipe is very different from the Bircher Muesli bowls you can find nowadays. The ones I tried in Switzerland were very sweet, made with refined sugars and some version of dairy, condensed milk, cream, milk and/or yoghurt. I have created a super delicious, healthy dairy-free and refined sugar-free version. It’s closer to the original recipe but with a few twists. Bircher Muesli is the perfect breakfast if you don’t like to spend too much time preparing your breakfast in the morning. It’s very quick and easy to prepare. You simply soak the muesli overnight and in the morning your bowl of Bircher muesli is ready. Soaking is easy. It doesn’t take any extra work, just a little of planning. Soaking the muesli overnight also has two important health benefits. First of all, it improves digestion. By ‘cooking’ the grains, nuts and seeds overnight, they are pre-digested, which makes it easier for your body to digest them properly. Secondly, it improves the absorption of nutrients. Grains, nuts and seeds contain phytic acid, anti-nutrients and enzyme inhibitors that exist in the outer layer or the bran. They can block the absorption of important nutrients, including calcium, zinc and iron. Soaking the grains, nuts and seeds significantly reduces the amount of phytic acid and anti-nutrients. The soaking process makes the muesli more wholesome and nourishing, as it aids your body’s absorption of nutrients. 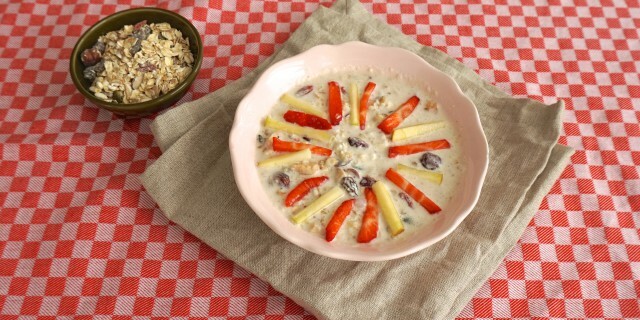 Mix the muesli ingredients and grated apple in a medium-sized bowl. Stir in the the coconut rice milk and lemon juice. Cover the bowl, place in the refrigerator and allow the muesli to soak overnight. The next morning mix in the coconut yoghurt. Serve the Bircher muesli with the fresh strawberries and apple and, if you like, honey to taste.